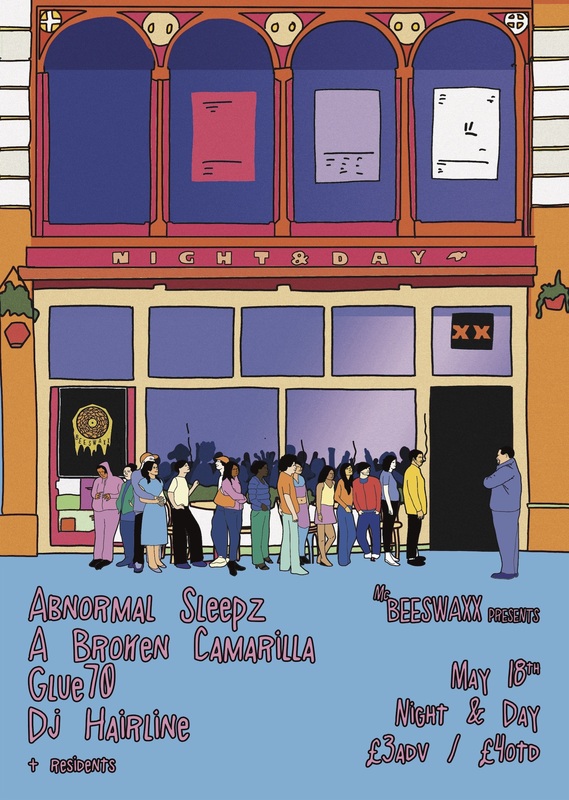 After two-and-a-half-years of Beeswaxx events, the latest instalment at Night & Day Café might just have topped them all. Witnessing such high-level live performances knowing that it was all homegrown was a sweet feeling – huge credit belongs to you lot for the support and the artists for doing what they do best, the vibe inside was unreal. As ever, onwards and upwards is the only direction Beeswaxx knows with our May line up providing the wheels to that. Hold tight for another scintillating evening of live PA’s and DJ sets from the very best Manchester has to offer – we’ll keep the price to a minimum and the energy to a maximum so don’t sleep on this one! There aren’t many upcoming urban artists across Manchester who haven’t linked with ABNORMAL SLEEPZ in some shape or form – such is his contribution to the growth of this city’s underground scene over the years. His collaboration with Inka on track: ‘Buildin’, was arguably the track of ‘Waveydon Ballads’ – Beeswaxx’s first record release. Not just a rapper/vocalist by any stretch – most of his outputs are a prime example of ‘write the theme tune sing the theme tune’. Ever growing and expanding as an artist, Sleepz has spread his wings to the world of drum & bass – recently signing to Lenzman’s huge new label ‘The North Quarter’. We predict a big future for this guy so we’re hyped to have him perform while we still can. A welcome return to the Beeswaxx stage for the mighty ABC – a team of four inspired, talented musicians who have been working as one making waves in the Manc underground for the last few years. Their trademark experimental hip-hop fusion style is kissed with soul and laced with lyricism – a real treat to experience live. Having played at more Beeswaxx shows than you can count on one hand, the crew have more recently been making serious moves in the scene with their own solo missions; but we couldn’t resist piecing the machine back together on the Night & Day stage. A refined performance brimming with originality, passion and new music is what we expect but we have no doubt they’ll bring so much more and out-do themselves, as they always do. We first locked ears onto this beat-maestro a few years back as he routinely graced the decks at Flow Theory events in the basement of Hold Fast, NQ. His DJ sets inject pure feel-good groove to any dancefloor as he fuses disco, synth-pop, house and hip-hop into his productions. His array of collaborations with Manc rapper/vocalist KinKai last year were nothing short of master strokes and created a new sub-genre of ‘hip-hop beat’ that you wouldn’t dare to try and pigeon hole. This booking has been a long time coming for us; make sure you bring your dancing shoes. Beeswaxx co-founder/resident DJ HAIRLINE orchestrated the dancefloor so exquisitely at the last event it left us no choice but to give him the light on the line up. His versatility in selection and prowess in mixing leaves any dancefloor nestled in the palm of his hand. Disco, garage, drum & bass, hip-hop, latin, funk and soul are what he spreads on his toast in the morning – stick him on the 1s & 2s and you can’t believe it’s not Butterz! Throughout the night Beeswaxx residents will be keeping the vibes alive – delivering funk, garage, hip-hop, disco and all the rest – so get down early!